With users ranging from scooter riders, skateboarders and BMX daredevils, asphalt based designs can risk turning out to be unsuitable for some once the asphalt has dried and the officials have cut the ribbon. But help is at hand for designers seeking out a track layout that is affordable, flexible, and built from high quality components that arrive on the back of a truck and easily assembled within a day. 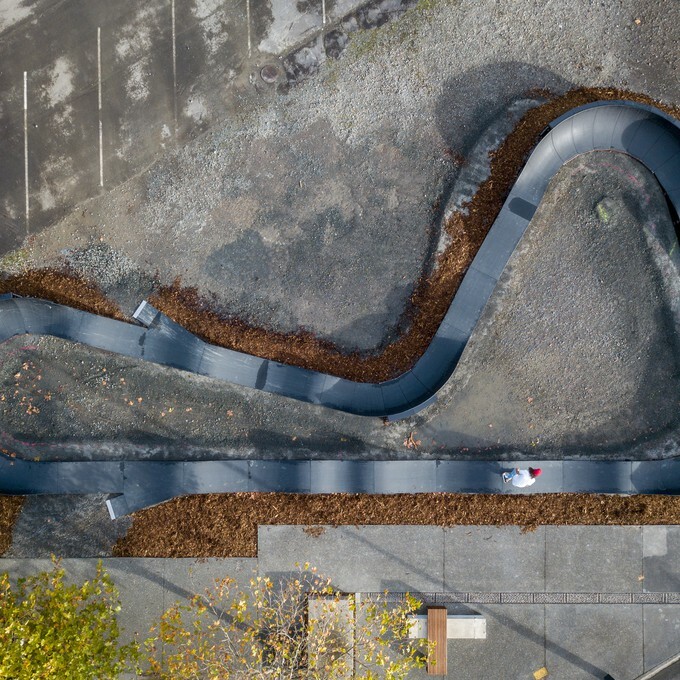 The Modular Pumptrack system offers councils and designers 13 different pre-designed layouts, or the option of a customised bespoke track design. ParkLife is now New Zealand’s exclusive dealer for a new concept in pump track design and construction. Built from high quality composite components with a high level of UV resistance and weather proofing, Pumptrack’s modular “lock together” track components do not require extensive site preparation, keeping area disturbance to a minimum and avoiding the complexities and delays of design, resource and building consent applications. With the track layout pre-determined, designers and landscapers are free to focus on the aesthetics and environment surrounding the central attraction. The tracks can be assembled in as little as a day. “Typically a free draining, relatively hard surface will suffice on installation, or on grass we can provide an interlocking tile as a base and at most a compacted base of 75mm gravel. This helps keep installation time relatively low, and hassle free,” says ParkLife director Sally Farmer. Auckland Council’s Panuku, the city’s rejuvenation division has been among the first in the country to place a Pumptrack on underused city land in Henderson. The Pumptrack complimented the city’s EcoMatters bike initiative set up on the same site, providing a drawcard for people to engage with council staff on cycling skills and initiatives. Connie Clarkson, manager for Panuku’s commercial place operations said the flexibility of the Pumptrack has proven a major highlight for the council. She said response from community groups has been excellent, and the track held strong appeal for a wide range of users, from children on trikes to skateboarders and BMX riders. Auckland Council has used Pumptrack in several sites. Panuku’s “World Cup” model track with its 65m rideable loop includes precisely engineered berms and rollers found in all the Pumptrack designs. It has won a big thumbs up from riders of every category in the community. Given Auckland’s high rainfall at certain times of year the track’s surface copes well with moisture levels. Its patented fibreglass grip surface is capable of being ridden safely after a rain shower, unlike other surfaces. A high standard of European quality control guarantees durable components throughout the track system, from the stainless steel and zinc anodised bolt systems, European larch solid timber construction and the patented reinforced fibreglass non-slip riding surface. All help keep maintenance costs minimal. This contrasts with traditional asphalt designs where cracking and break down are common, particularly in high rainfall and high temperature environments. Councils and bodies seeking a novelty drawcard to promote cycling events in particular have found the Pumptrack’s easy to assemble design ideal for short term placement, with configurations suitable for putting in the most space challenged environments for short periods. “And of course there is nothing compelling it to be moved, it can be a permanent fixture if that is what councils want, the high quality build means it is highly durable,” says Sally Farmer. With a cost of about $1100 a linear meter and 13 designs to choose from with minimal site prep costs, Sally Farmer says the Pumptrack can be tailored not only to specific council spaces, but to the demands of tight budget constraints, without sacrificing quality in the process. Pumptracks can be located on a temporary basis, or permanently.